Transport for NSW owes the community an answer! 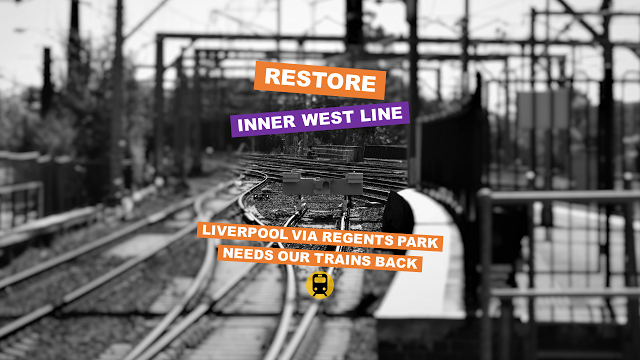 The evidence to support Restore Inner West Line/Liverpool via Regents Park trains cannot be ignored by Transport for NSW, Sydney Trains or Transport Minister Andrew Constance! 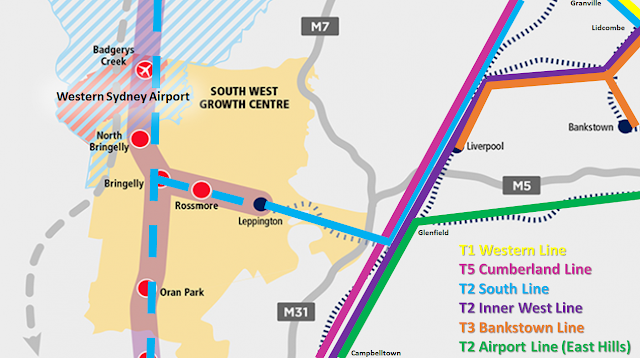 The community deserves a truthful response - an acknowledgement that commuters have been worse off and that the 2013 timetable change has failed to achieve its goals for the area. Hence the need for the Inner West Line and Liverpool via Regents Park train to be restored! Restore Inner West Line welcomes the newly announced "More Trains, More Services" program by Transport for NSW and calls for an increase in the number of Western Line trains stopping at Lidcombe station. Southwest Sydney commuters are worse off since the Sydney Trains timetable was substantially changed in 2013. Changes designed to “detangle the network” and improve reliability on the Inner West, South and Western Lines instead reduced citybound services for customers at several stations. Restore the Inner West Line Community Action Group spokesman Roydon Ng said passengers between Carramar and Berala can no longer catch direct services to the city from Liverpool. Prior to the 2013 changes, customers from Berala could get to Central station via Regents Park on the Liverpool line in 36 minutes – now, that journey on the Bankstown line takes 49 minutes. “Transport for NSW has failed to provide concrete evidence showing that the 2013 timetable change improved reliability on the Inner West, South and Western lines,” Mr Ng said. 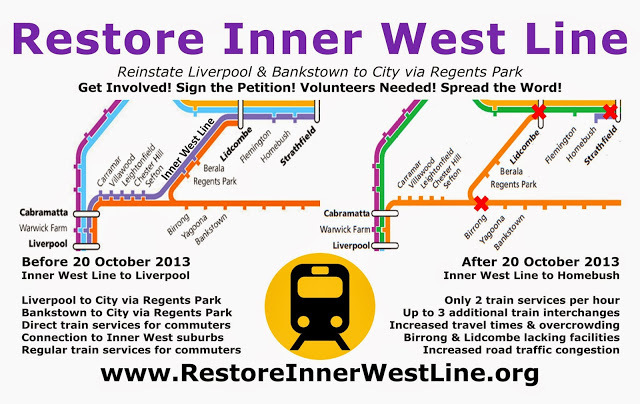 Restore Inner West Line condemns Transport for NSW, Sydney Trains and the NSW State Government over its continual denial regarding the significant commuter impact of the Inner West Line truncation (to Homebush) and removal of regular Liverpool via Regents Park train services in 2013. EXCLUSIVE: Transport for NSW documents admit 'cuts to Inner West Line trains and forced interchanges' are most significant issues from 2013 timetable change! 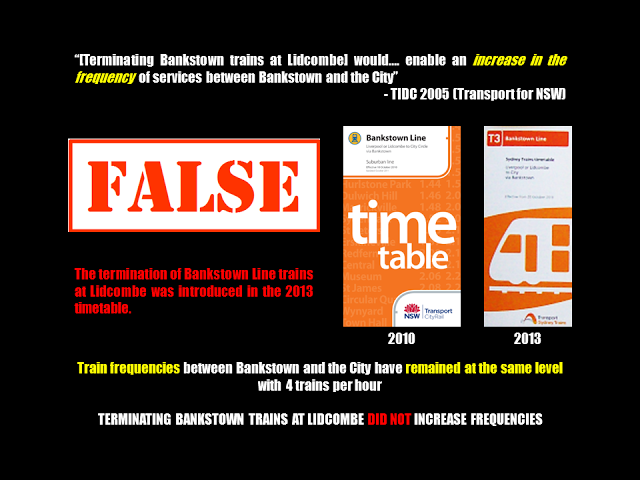 Transport for NSW claimed in 2005 that terminating Bankstown trains at Lidcombe would "enable an increase in the frequency of services between Bankstown and the City". The termination of Bankstown Line trains at Lidcombe was introduced in the 2013 timetable. However train frequencies between Bankstown and the City have remained at the same level with 4 trains per hour. Terminating Bankstown trains at Lidcombe did not increase frequencies hence defeating the one of the main purposes of the 2013 timetable change.